Teachers should be aware that the content is at the high school and undergraduate level but the presentation design is more appropriate for middle school. Have students ignore the Hurricane Ike section. Teachers can choose content from the right-hand menu that meets their teaching needs. The spoken text is displayed as captions at the bottom of visualization. 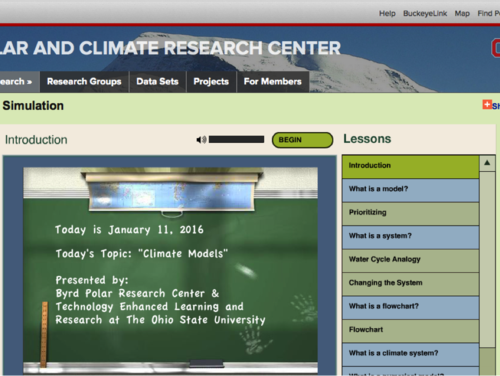 This interactive simulation/animation on Earth system science and climate models is produced by the Byrd Polar Research Center and the Technology Enhanced Learning and Research Center at Ohio State University. The use of analogies, such as bathtubs to convey the idea of hydrologic and atmospheric reservoirs, and other easy-to-understand concepts make this a strong introduction to modeling in general and climate models in particular. Comments from expert scientist: Comprehensive introduction to the concept of models in general and to climate models in particular. Some of the slides would be suitable for young pupils or the general public, while on others complex physical fornulas are introduced and are targeted at more advanced students. Accessible to many different audiences. This entire interactive simulation could potentially be used as a mini course for undergraduates on the use of models to understand environmental systems. Most of the sections of the resource can be used independently with ease. The content is provided through a computer-generated animated character in a classroom setting. The character "lectures" through a series of learning units that include interactive activities to aid a learner in developing an understanding of Earth systems and climate models. The final section, focusing on changing weather dynamics during Hurricane Ike, has some inconsistencies that may confuse some learners and is the least relevant part of the resource for understanding climate models.